Seven years ago we brought home a white furry bundle of pure joy and it has been seven years since our home was adorned with a decorated Christmas tree. All of our ornaments that have been collected throughout the years, along with the memories I have of each, stay tucked away for safekeeping in the attic space above the garage. Instead of decorating a tree, each year I decorate the mantle and other surfaces that are beyond the reach of the lovely and devilish seven year old Miss Sadie (I introduced her to you in a previous post, The Tale of Two Ragdolls). Although I miss our traditional Christmas Tree, I embrace fully the fun of creating an elegant mantle piece reminiscent of the holiday season. 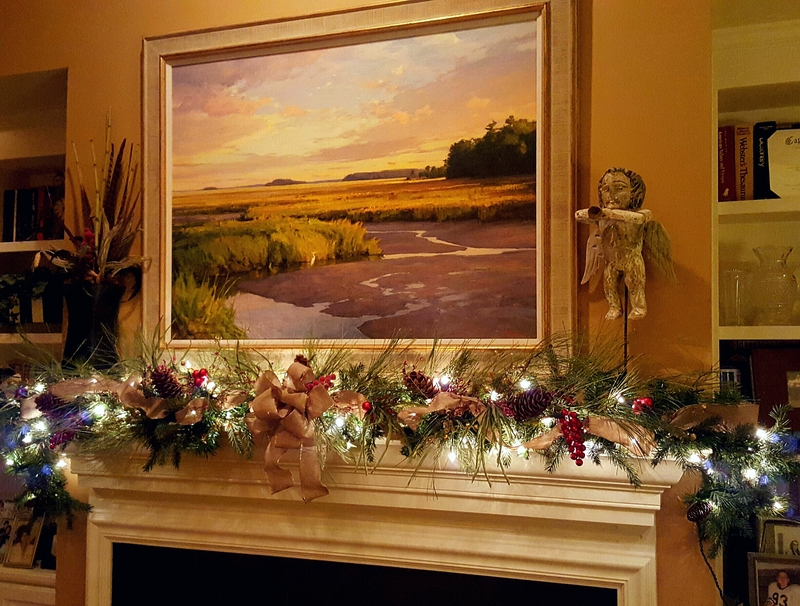 This year I was inspired by the beautiful painting, aptly named Lowcountry Splendor, above our fireplace. The painting was a surprise birthday gift from my husband, Ed. It is a limited reproduction canvas giclee from an original oil painting by Michael B. Karas, a noted landscape artist. The birthday gift is made more special because Michael is a good friend and neighbor and the frame, which is perfect for the picture, is handcrafted by Michael especially for the painting. To ‘gild’ the garland I weave wide ribbon purchased at TJMaxx into the garland and top it off with a bow in the center. This year I decided to use a neutral and textured style ribbon. The subtle color with a hint of glint is a nice complement to our artwork and creates a Lowcountry aesthetic. I still yearn for a tree. 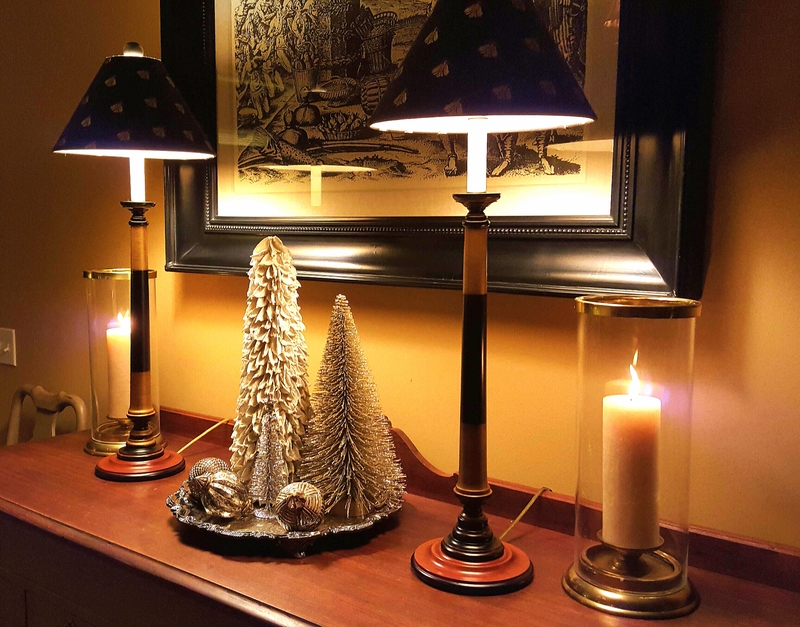 I could not resist purchasing the three tiny trees to create a small forest vignette on the sideboard that sits across the room from the fireplace. A tiny tree is better than no tree! The two larger trees were purchased at Target. The very small tree was purchased at Dollar Tree for $1! The star atop the smallest tree is perfect. The trees are arranged atop a silver serving tray and surrounded by holiday ornaments from years past. This little tree vignette gives me great satisfaction. 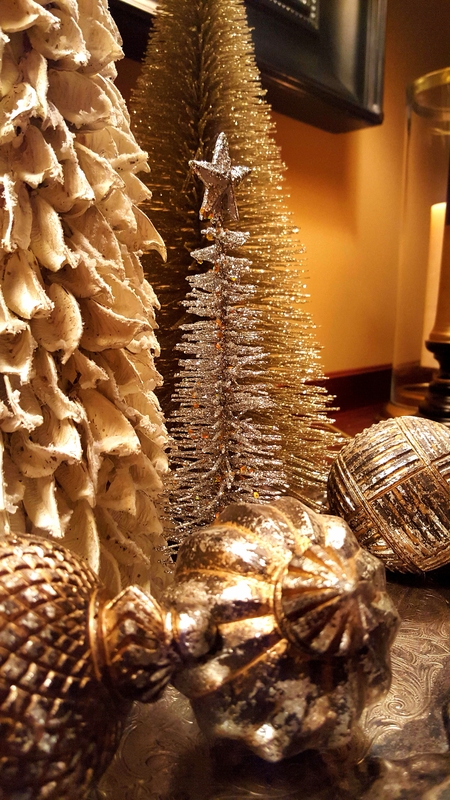 I love the subtle sparkle it adds to my holiday décor. Although Christmas has passed and New Year’s is right around the corner I plan to leave the mantle piece and tiny tree vignette in place. My husband and I love the twinkly lights and sparkle. 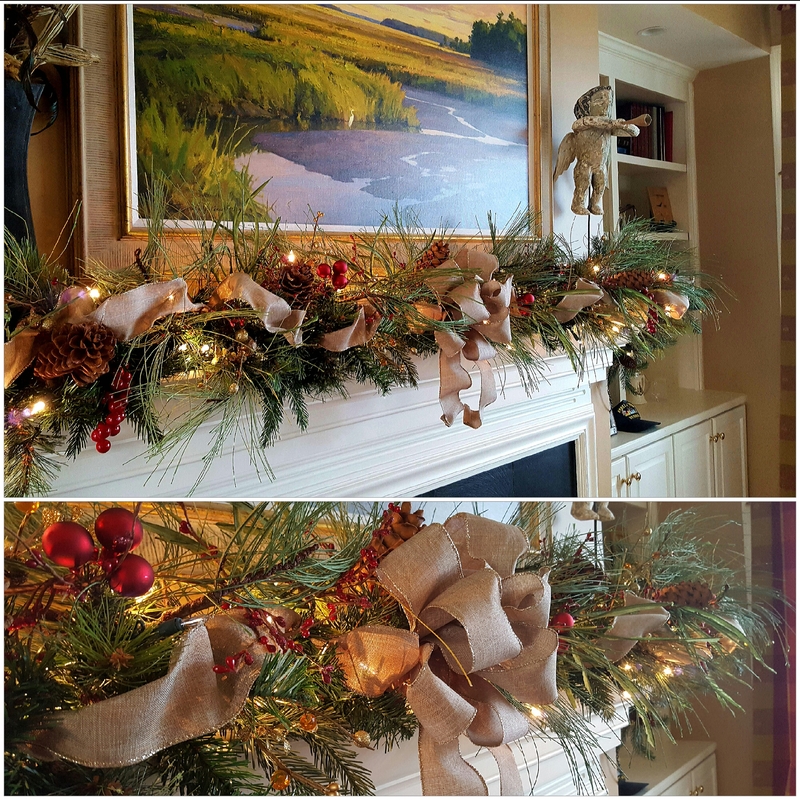 Last year, we left our holiday mantle in place until just before Valentine’s Day. I admit that I was tempted to redress the garland with hearts and bows! Very lovely! We don’t have a tree either (there just isn’t a good place for one in our living room) but I don’t really miss it. 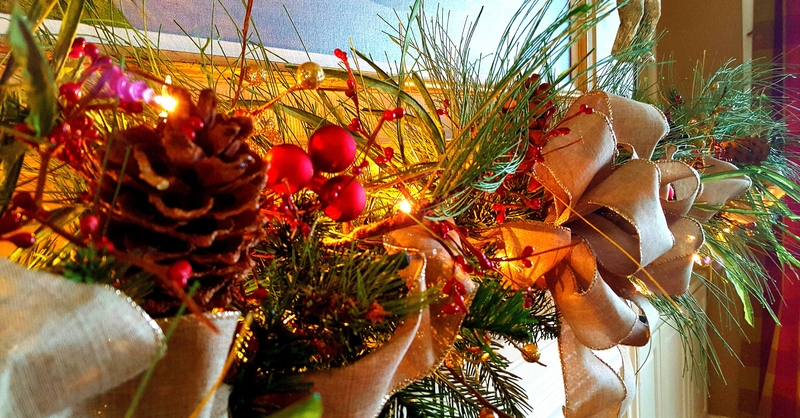 I have fun decorating other areas and then, after the holidays, it’s not so difficult to put everything away. I love your little tree display! Thank you! The tiny trees are going to become a holiday tradition. I have my eye out for more of them to add to the forest! And I agree a benefit of a ‘no tree’ Christmas is simple and easy clean up. I have only one box to pack. Happy New Year! Very nice! I wonder if Miss Sadie appreciates your creativity? If her consistent efforts to get close to the mantle and atop the sideboard are an indication, I would say she loves the creative effort! Love the painting above your well-dressed mantle. Happy New Year! Thank you! Happy 2016 to you!